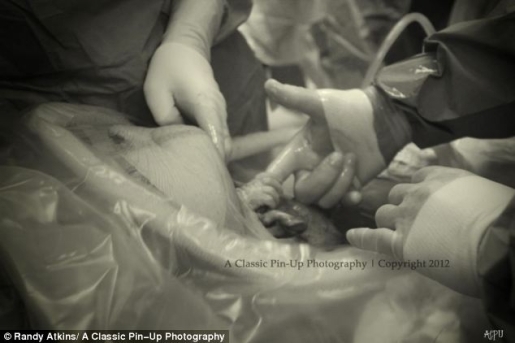 Reaching out from her mother’s womb, a baby bonds with her father. When they say that pregnancy and giving birth are the miracle of life, they aren’t kidding. Babies can be pretty amazing, even from within the womb. Even before baby Nevaeh was born, she was bonding with her father. On October 9, mother Alicia Atkins was rushed to the hospital in Glendale, Arizona, for an emergency cesarean section. In the moments after the doctors cut the mother open, the baby stuck her hand outside of the woman’s belly and got a little playful. The baby grabbed her father’s finger from within the womb of her mother and the whole thing was captured on film. When the unusual baby shot hit the facebook page of Alicia’s business, A Classic Pin-Up Photography, they went viral. Rather than being disgusted, what with the surgery, people were simply amazed by the moment, and with good reason. Now mother, father, and baby are basking in viral fame and little Nevaeh is perfectly happy and normal. No tail or anything.